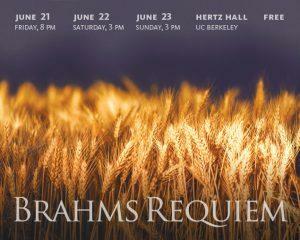 I want to thank and praise the graphic artist who put together the elegant advertising postcard for the Brahms Requiem. I love the photograph of the ripe wheat which is perfect because, for me, it is connected to the meaning of this special “human” Requiem. At the beginning, the Requiem has beautiful agricultural images of the sowing and harvesting of grain. For example, in Movement I, there’s the passage “Who sows with tears shall reap with joy” from Psalm 126. Then, just a little later, there’s the passage, also from Psalm 126, “They go out weeping and carrying precious seed, and they return with joy carrying the sheaves of their harvest.” In Movement II, a metaphor from nature is balanced fairly soon by a metaphor about farming. So, the beginning passage is “For all flesh is like grass and all our mastery is like the flowers of the grass which wither and fall” (from the New Testament’s first letter of Peter, Chapter 1). Then comes the passage with the counter-message: “Be patient. See how the farmer waits for the precious fruit of the earth and remains patient awaiting the morning and evening rains” (from the New Testament’s letter of James, Chapter 5, with an echo of Hebrew Bible passages about rain). As I slowly learn the Requiem, I am beginning to think that its power lies in the realistic recognition of our helplessness and sadness balanced against our hope for what is better. I just love it a lot. It goes to the heart. So, I really think our graphic artist (whose name I don’t know!) did a great job. Kudos! P.s. I want to thank Nancy Brink who helped me manage to navigate StoryChorus. She was gracious and patient. I second the appreciation of the postcard. It’s a reflection of a particularly beautiful, gentle part of the Requiem. Also note that while we are singing about waiting for the rain, the musical accompaniment softly adds a little pizzicato “pitter patter” motif — so lovely! 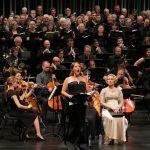 Wonderful exposition of the text of the Brahms Requiem. I agree the graphic for this concert is really beautiful and conveys peace for the living and renewal which is inherent in the piece. The graphic artist is Kris Kargo, BCCO soprano. And thanks to Nancy Brink that we have this forum, Story chorus for singers to express their thoughts about out music.